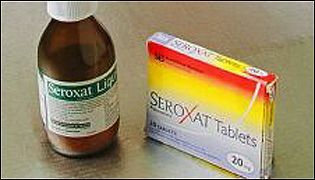 Seroxat is part of a family of drugs known as Selective Serotonin Reuptake Inhibitors (SSRIs). They were launched in the 1980s as the non-addictive alternative to Valium. Seroxat is one of several SSRI's on the market. Very quickly these drugs became popular with doctors because they appeared to offer a cure for everything from anxiety to phobias. Millions of people have been helped by them and indeed prescriptions of SSRIs have risen dramatically in the past 10 years. These drugs are worth billions of pounds to the drug companies who make them. Common brand names include Prozac, Seroxat (known as Paxil in the US), Lustral, Cipramil, and Faverin. The main effect is that they keep different varieties of the chemical most commonly associated with happy and positive moods, serotonin, floating around the brain for longer by blocking their re-absorption into the brain. This then stabilises the person's mood as they feel happier and less depressed and less prone to mood swings as the serotonin levels stay constant in the brain. Although these drugs have proved beneficial for many patients, it has been reported that a small sub-group of patients may be susceptible to severe withdrawal symptoms and sometimes even intense agitation leading to suicidal thoughts. Pharmaceutical companies strenuously deny the claims and insist that the drugs are a safe, effective treatment. Many users who have suffered problems have used the internet to share their experiences and campaign for warnings to accompany prescriptions of these drugs. However, last year the Medicines Control Agency here in the UK asked the drug company GlaxoSmithKline put a warning in with the drug Seroxat: "Occasionally, the symptoms of depression may include thoughts of harming yourself or committing suicide. "Until the full antidepressant effect of you medicine becomes apparent, these symptoms may increase in the first few weeks of treatment." Critics argue that this warning implies it is the condition and not the drug that may cause the suicidal feelings.